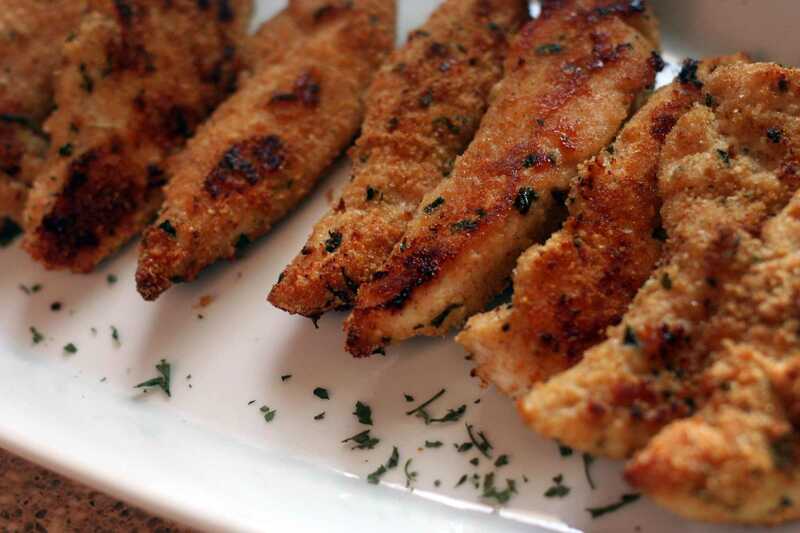 Baked Parmesan Chicken Tenders are just plain healthy and delicious!! My family loves chicken tenders but I don’t want everyone taking on the extra calories of frying the chicken tenders. These little babies are baked at a pretty high heat of 400 degrees and I use olive oil spray to coat the chicken tenderloins. This makes them crispy on the outside and really moist and tender on the inside! I use chicken tenderloin, they were on sale and then reduced again! I just couldn’t pass up this sale! We have 6 people in our house , but it honestly feels like I am feeding 12! They enjoy food! So if I can get a sale, I am on it! That being said, I have no problem using boneless chicken breasts and I slice them down to make tenders, trust me no difference in taste, and they are all delish! This of course has to be served with my Honey Mustard Sauce! 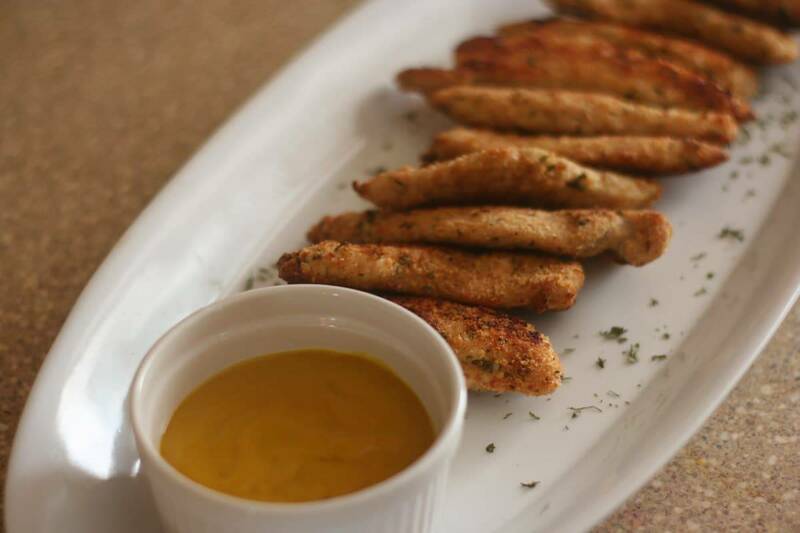 Its another easy recipe and tastes great with these chicken tenders! I have a few different chicken tender recipes but this was my first chicken tender recipe I made for my children. I started making this for my oldest son when he was just a little one and starting to eat ” people food, as we called it! 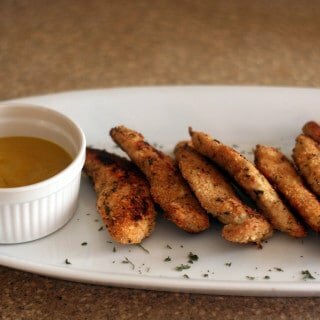 I made all of my children their baby food so I had no choice but to make their chicken tenders and it was really easy and so much better for them and the cost was so much less than buying processed chicken tenders! So this is one of my favorite recipes because it reminds me of when my babies were actually babies! What is so comforting to me is that they are all, except for our wee Deirdre, who isn’t so wee, I am getting way of the topic of Parmesan chicken tenders! They are adults and they get so excited every time I prepare these chicken tenders and they still love them! Just makes me smile knowing they still love these! Okay, now I am sounding corny!! Back to the recipe, it is low-calorie because it is baked and I only use egg whites. I buy egg white in the carton at Costco, easy and cost effective! Whole wheat bread crumbs and Parmesan cheese, bake for about 20 minutes and serve with Honey Mustard Sauce and a salad! I try to get one or two before the kids eat them all! These are also great over a bed of greens at work or school for lunch or dinner! I hope you like this recipe, and if so, please share the love on Facebook, Pinterest, or your favorite way of relating to your friends and family, and please continue connecting with me on Instagram, Pinterest, Twitter, Bloglovin, Google Plus ! Dredge the chicken tenderloins into the egg white mixture. Then dredge the chicken tenderloins into the Italian seasoned whole wheat bread crumbs. Place the breaded chicken on the seasoned cookie sheet, continue until all chicken is breaded and on the cookie sheet. Spray the top of al the breaded chicken with the olive oil spray. For not so crispy tops, just cook for aboout 20 minutes, If you want to have crispy chicken tenders on both sides, after about 15 minutes, turn the chicken tenderloins over and cook for about another 5 minutes to crisp both sides ! Serve with my Honey Mustard Sauce and enjoy! So much better than frozen chicken tenders. My kids love these all the time! I think my kids would love these- I’m going to give them a try! These look great – I would just substitute gluten-free bread crumbs and try them that way. Thanks for sharing! That works so well for us because when I want the fried stuff I make them I don’t eat…but I can make this for the whole family. Thanks for sharing. You are very welcome Rania! Me too, which is why I developed this recipe, I didn’t want to miss out on the chicken and I didn’t want to eat a high fat dish and it isn’t a processed meal. Enjoy! 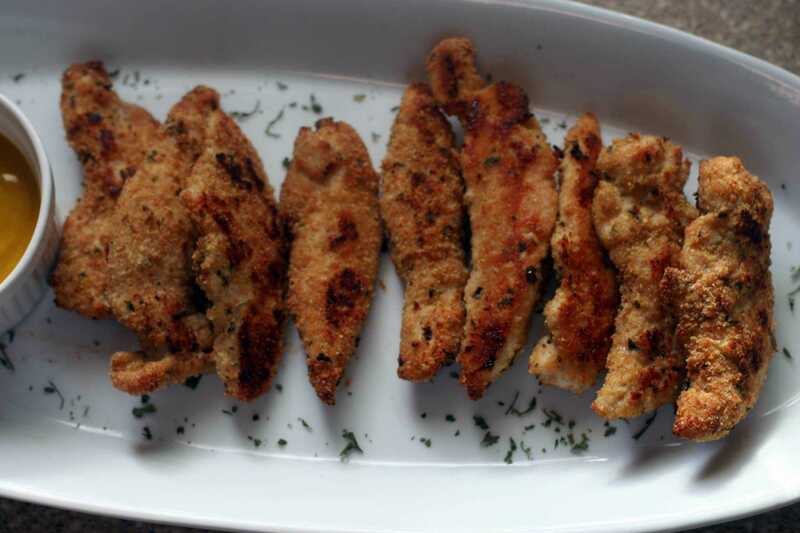 These baked parmesan chicken tenders sound amazing. I love parmesan cheese and so does my family so I will have to make these for them for sure. Thanks for the recipe. You are very welcome Rebecca.I hope you and your family enjoy the recipe. I hope you do – easy and delish! This sounds absolutely amazing! Might try this out this week. Jonathon, I hope you do! Oh yumm. I like to cook up chicken ahead of time and put in the freezer. Makes for a good meal fast. Me too Debbie! These are the perfect freezer Chicken Parmesan Tenders ! I always bake my chicken. I think it tastes so much better baked. I love this recipe! Parmesan is one of my favorites! Thank you Jennifer – I so agree and so much healthier baked ! These look great! Pinning for later. Definitely want to try these. They’re so perfectly golden brown and look fantastic! I like the parmesan cheese in these. They are yummy – I hope you give them a go and enjoy! These sound delicious, and I love that they are baked. I also like that you used egg whites. Great idea! My boys love chicken nuggets so they would love these. I hope they enjoy Tara! They freeze and reheat really well! Thank you Claudette – let me know how the chicken tenders recipe goes for you! 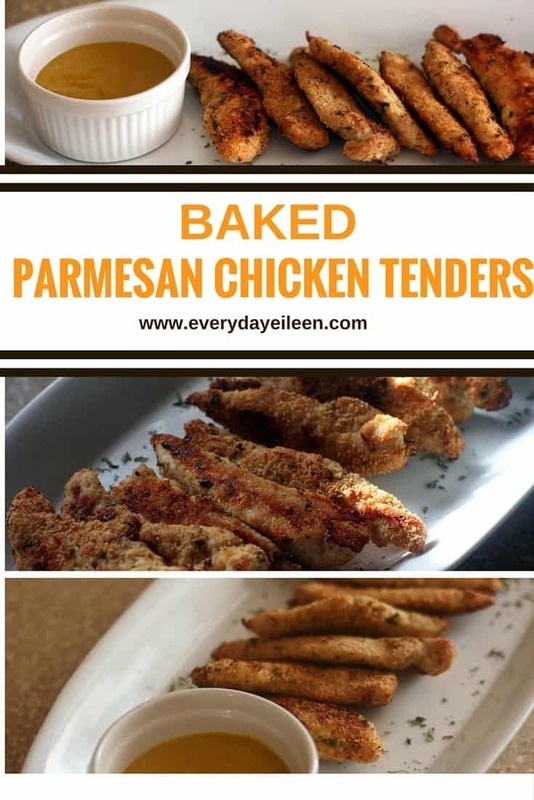 These chicken tenders sound delish – I love Parmesan yum! I hope you like them – the parmesan adds a great flavor! We make chicken tenders, but I’ve never tried them with whole wheat breadcrumbs. It’d definitely be a bit healthier this way. Oh my. Do these ever look amazing? I need to make these I know my kiddos wold love them! I hope you do – and remember they freeze really well too! Low cal and low fat snack, perfect for me! Love finger food that is easy to snack on like this. I loved baked food than fried food, so this would be perfect! Thanks for the recipe! Healthy and delicious. I’m always on the look out for ways to serve chicken breast. I can’t wait to try this. Thank you – I hope you enjoy – these are tasty! They are so easy and you can also make a ton and freeze – they reheat really well! Those sound phenomenal. I can’t wait to make these. Yum! My family would love this! Elizabeth ~ I feel the same way about chicken tenders! These are really easy and quick to prepare! I hope you enjoy! Let me know how you like them! I’m very big on baking instead of frying. We’ve done chicken wings in the oven as well. I love these chicken tenders. Great for weeknight dinners. IttyBittyFoodies – I love baked chicken wings as well! I hope you enjoy this recipe tpp :)! Kyleigh – you are so funny! 🙂 I am soglad you will be making these chicken tenders. I hope you enjoy and let me know how they taste!! Thank you Nicole! They do go well when paired with pasta! I hope you do make this recipe!